I’ve been thinking a lot about mission the last few weeks. One of my goals for this year is for pervasive saturation of the vision and mission in the heart and minds of our volunteers and leaders. Actually, it’s not optional for our leaders. They have to know our mission… what we’re trying to accomplish. I’ve been talking with my team how we can continue to over-communicate our mission so that everyone will get it. Just before Christmas I had to stop at a gas station to use the bathroom. I usually try to refrain from taking pictures in the rest room, but I couldn’t resist. Just above the dirty toilet was Tetco’s mission statement. What was especially ironic was their first line, “…by providing quality service in a clean and pleasant atmosphere.” I’ll give them the benifit of the doubt. It wasn’t one of those really disgusting gas station bathrooms you find in those small interstate towns in Mississippi, but it wasn’t clean. 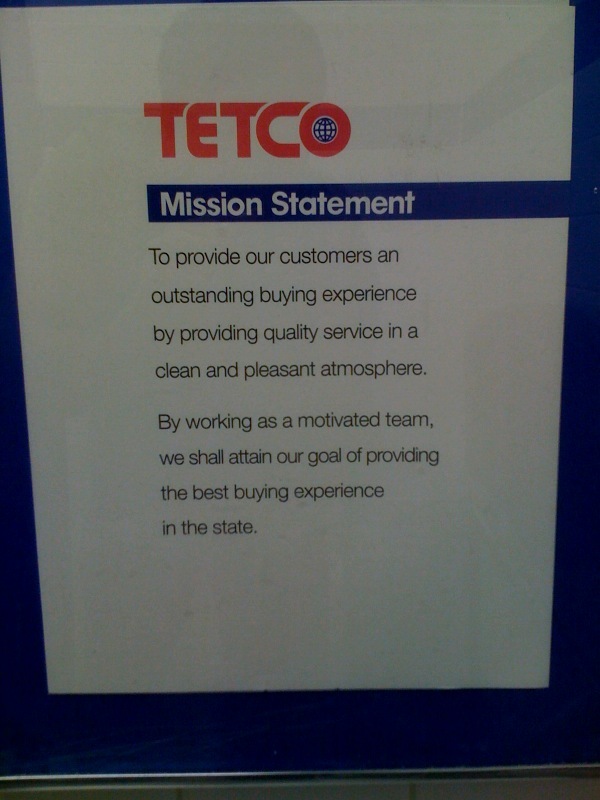 Why did Tetco put their mission statement above the toilet in the men’s room, probably the first place to get disgusting at a gas station? It was either gutsy or it was stupid. I kind of admire them for doing it. That way if they actually could keep the bathroom clean, it would make a strong statement about how they live out their mission. But if they don’t, it’s more of a joke. Kind of like the children’s ministry that paint’s “the best hour of your kid’s week” on the wall of a church with a boring children’s ministry. I think this is risky and I like it. It’s all or nothing. You’re either going to win big or you’ll be a joke. No space for playing it safe. What do you think? How can you take more risk with living out your vision/mission?